Finding Wonderland: The WritingYA Weblog (archive): Turning Pages: Only YOU Can Save...Mankind, the Planet, the Realm, the Earth, Him/Her... Pick one. Turning Pages: Only YOU Can Save...Mankind, the Planet, the Realm, the Earth, Him/Her... Pick one. It's time for another reading round-up, and let me tell you, the books are being read faster than the reviews are being written. I'm keeping my head above water, but only just! However, someone out there appreciates our efforts here at Wonderland; a reader we don't know informed us that he'd gifted us with an award. Thanks for the Lovely Blog props, Mr. Maurer; we do try. Only YOU Can Prevent... Pick a heroic tale, and you'll see the familiar steps of the journey. The untried hero/ine is bewildered and beset, wrenched from Life As They Knew It onto the trail of a Quest. This journey is thrust upon them because they are Good, or Noble, or Just-Minded, or Fated and will not tolerate Bad, or Ignoble, or Unfair. Science Fiction and Fantasy handles these tropes routinely; a few novels even do it with flair. You've got a hero/ine. You've got a quest that only THEY can fulfill. Will they find success? Aden Stone's habit of talking to himself has gotten him a lifetime of mental institutions and the label of schizophrenia. Okay, so he does hear voices, but they're...real, and they're really there. They're the voices of the four souls somehow trapped in his body ever since he can remember. He'd deal with them, if a.) stop raising dead bodies, b.) stop vanishing, c.) stop inhabiting other people's bodies, and d.) stop being able to tell the future. Obviously, the souls are implicated in the insanity going on with him, and their anxious advising, complaining, cajoling and opining really might drive Aden nuts. The voices are silenced, however, in the presence of Mary Ann Gray. Why? Who is she to Aden? And who is the other girl Aden dreams of, who says he has called her to him? Can Aden save himself? Or everyone else? 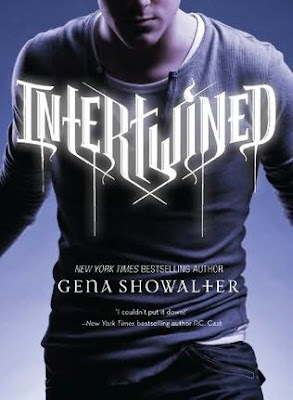 Intertwined, by romance legend and YA newcomer, Gena Showalter, does have an interesting premise. The cover is pretty standard for romance -- guy chest -- but I guess Covered Guy Chest is the name of the game in YA. I kind of wish the cover gave some clue of what the book is about. It seems to be the first in a series, which might be why it sometimes has a chaotic feel of too many characters and multiple competing storylines. Slightly awkward, but the series has potential, and if you're a fan of forbidden romance with a side of Inadvertent Necromancy, this might work for you. 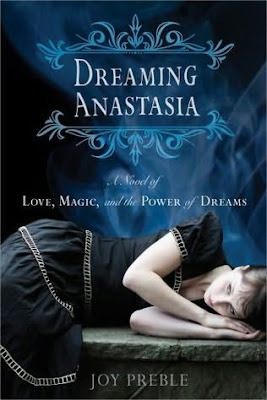 In Dreaming Anastasia, Anne doesn't dream about much more than her grades and the right choice of college, but lately, things have ...changed. She's dreaming of being in a mansion, and watching everyone around her gunned down. She dreams she's in a tiny cabin, talking to her doll, in claustrophobic confines with a very old woman and her cat. The dreams are recurrent, and all too real. Ethan, a new boy at school seems to know something about her. He knows she dreams -- and he's come to tell her that she needs to help him save someone named Anastasia. She's the youngest daughter of the Tsar of Russia, and she's the only survivor, when her whole family died. Anne is supposed to save her. But how? And, what if Anastasia doesn't want to be saved? 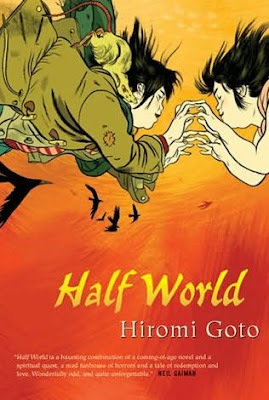 Probably my favorite from this bunch was Hiromi Goto's Half World. If you loved Studio Ghibli's Spirited Away (Hayao Miyazaki), this book will overwhelm you with the same wonderfully surrealist energy, and you'll be hooked. Pudgy, miserable Melanie Tamaki has always found her friends not in the human world, but in the world of crows. They're always there, and they're not mean like the girls at school. Mel's mother is ...fading, a fiercely private woman who is drinking her sorrows away. Melanie has no idea what has happened to her father, and there is only one, desperately unhappy looking picture of him in the house, which Melanie finds the day her mother disappears. When the phone begins to ring -- the phone which has been dead for the last five months -- and Melanie is told by the mysterious and menacing Mr. Glue that her mother has abandoned her -- it's up to Melanie to go where she's told, in order to save her. She's terrified. She's only fourteen, exhausted, scared, and starving. And she just wants this whole nightmare to go away. It's not going anywhere, but Melanie is, and with the help of her strange old neighbor, Mrs. Wei, who gifts her with a jade rat pendant and a white stone cat, Melanie is on her way to the Half World, to find her mother, and the truth about the world in which she lives. Can Melanie save her -- and perhaps save the whole world? There have been Ingrams on the farm now for six generations, counting Jerry. Dad and his brother, Uncle Ted, have the family land divided between them -- unevenly -- and both mean are farming on their inheritance. Somehow, Uncle Ted makes it look easy. He's successful in everything he does. His son, Will, is handsome and popular at school. All of this is in direct contrast to Jerry's family. His Dad is taciturn and quiet. Their farm barely squeaks out enough to get by, and the sheriff is always lurking by, snarling at Jerry's Dad, and peering at him with suspicious eyes. There's something different about the Ingrams. But they're not talking. Jerry's project of digging in the sunflower field for Native American relics isn't something his dad encourages. Despite what a chance look at an aerial map suggests, Jerry's discouraged from talking too much about his finds. His Dad is worried that archaeologists tromping through the sunflowers will endanger their already at-risk livelihood. And... the Ingrams need to keep their secrets. Jerry's keeping secrets -- from his Dad and his friend Shaun, too. He's found more than ancient Native burial grounds. He's found proof of an alien civilization, and a portal to another world. Unfortunately, doors open two ways. And not everything on the other side is friendly... Can Jerry get back in time to save ...his farm, his family, and his town? We don't have many small press books in the Cybils, but it's always great when we come across one that is a real gem. Read and discover Jerry's fate in Henry Melton's incredibly readable book, Falling Bakward. You can buy Intertwined, as well as Dark Calling: Deomonata #9, and Dreaming Anastasia, Half World, and Falling Bakward all 2009 Cybils YA SFF Nominated Books , from an independent bookstore near you! Books courtesy of the library, individual authors, and Bloomsbury, USA for use of the Cybils. Oh that is nice to hear (the real gem from a small press). I'll look for that one! Ditto, Charlotte! Those last two sound very intriguing. The first one, with the four personalities inside his mind...did you ever see that TV show in the late 80s/early 90s called Herman's Head? Congratulations on the well-deserved award. I don't know how you do keep your head above water when you're reading this much and writing such great reviews. Brava. I love all the colorful covers here, invites me into the books.